I have a blog post (or more likely series) that I’d really like to write and I need your help. When I started this blog, I worried it would seem like an awkwardly smooshed together amalgam of INFJ blog and Christian blog. You’re supposed to find a niche or theme of some kind and focus your blogging there. Not start two blogs on the same site and post one on Mondays and one on Saturdays. But I felt this what what I should do and so I did. And it’s been wonderful. I’ve heard from so many INFJs who find my blog through the Myers-Briggs posts and then comment because they discovered I’m Christian. I’ve also heard from other types. Most surprisingly, quite a large number of NTs want to talk about their faith. It’s been fascinating to hear from the types stereotyped as the least religious. Many talk about the challenges they face, especially in connecting with other Christians or in feeling like their faith walk doesn’t follow the “normal” pattern. That has me wondering: if Christianity is a faith meant for all people then why aren’t we doing a better job of connecting with all personality types? It’s a very broad generalization, but most Christians in the United States seem to be Sensing types and/or Feeling types. And that’s who many churches cater toward. They’re focusing on the sort of traditions that make SJ types comfortable, or trying to engage SP types in sensory worship experiences, or appealing to the spiritual interests of a few NF types. I firmly believe God created personality variations for a reason and that He longs for a relationship with all people. There are already Christians of every personality type who have strong walks with God. But they’re not all equally valued and understood in the churches. And I’d very much like to start changing that. As this project continues, I’ll post links to the finished posts here. If you see your type on the list, you’re welcome to head over to that post to read what your fellow believers wrote about their faith and leave your perspective in the comments section. I’m hoping to turn this project into a book eventually, and I greatly value your perspective even if I’ve already published a post on your type. Here’s where you guys come in. 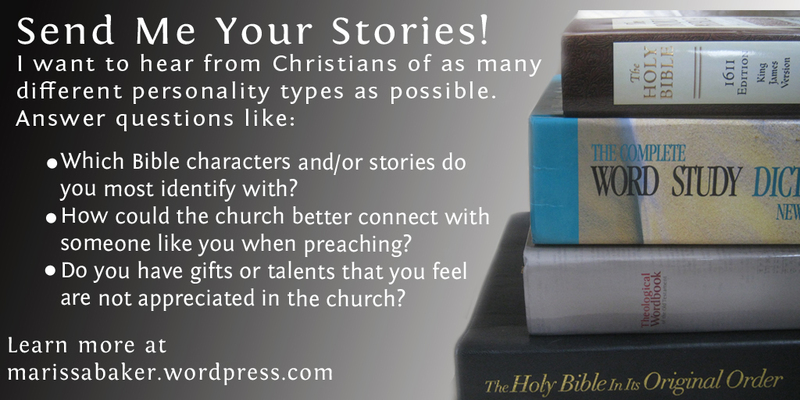 I want to hear from Christians of as many different personality types as possible. If you want to contribute and don’t know your personality type yet, please check out my post Finding Your Real Myers-Briggs Type (if you can’t narrow it down to a single type or just want to take one online test instead of researching typeology in-depth, that’s okay. I’d still love to hear from you). Which Bible characters and/or stories do you most identify with? Do you have gifts or talents that you feel are not appreciated or that you don’t have an opportunity to use in the church? Do you have gifts or talents that are particularly encouraged and supported in the church? Are there expectations from other Christians that you have a hard time meeting because of how your mind naturally works? Which teaching/preaching styles connect with you best? How do you like to hear and learn about God and His word? In what ways could the church better connect with someone like you when preaching the gospel? What’s one of the biggest challenges you face as a Christian? Why are you a Christian? In other words, what makes you believe this faith is the right one? You can either leave a comment here or send me a private message through my Contact Me form. Unless you tell me otherwise, I’ll assume that by getting in touch you agree I can quote you directly and credit you by first name (or screen name) and Myers-Briggs type. Please spread this around! The more people sending in their ideas and perspectives the better. Hopefully we’ll get enough feedback for several posts. Maybe it will even grow into an ebook. I can’t wait to read what you all have to say! I love C.S. Lewis too! I am a female Catholic from Germany and an INFJ. One Character I can relate to very much is Mary (Lucas 10,38-42). She instantly knows that this moment with Jesus is more important than anything else. I think she didn’t intend to upset her sister Martha. She was just intrigued by the words of our Savior and I like the way He changes Martha’s point of view. Yes, I am a teacher of theology and religious education. On the one hand I enjoy discussing matters of faith with other people but on the other hand I prefer a particular distance, too. I like to listen to metaphores, allegories or poetic speeches. Living in a world that is growing apart from Christian values. I was born with a deeply rooted faith in God. But to answer the second question as well: Because people are loved and accepted unconditionally by Jesus Christ. 1.Which Bible characters and/or stories do you most identify with? I identify with his life the most, the Psalms is mostly a reflection of an account of his life or how he felt from every season he was in. It is most relatable ’cause it was raw and earnest and it is the type of poetic that is life changing because it is God-breathed. He went through various hills and valleys, he faced consequences from his disobedience yet instead of remaining in rebellion, he always finds his way back to God in repentance. 2. Do you have gifts or talents that you feel are not appreciated or that you don’t have an opportunity to use in the church? Not a part of a particular ministry right now other than being a part of a cell group, been praying and planning to start my own as per God’s instruction. 3. Do you have gifts or talents that are particularly encouraged and supported in the church? 4. Are there expectations from other Christians that you have a hard time meeting because of how your mind naturally works? Not exactly, I have been studying apologetics so I am able to answer some of the difficult questions by some people I’ve met or share the gospel with. Hope I understood the question correctly. 5. Which teaching/preaching styles connect with you best? How do you like to hear and learn about God and His word? 6. In what ways could the church better connect with someone like you when preaching the gospel? Speak the truth as it is, with love. Our church in particularly has several avenues that may cater to different types of people. There are counselling ministries with sub categories, apologetics ministry and talks for the toughest questions about Christianity and other world views – I think is appeals to various types of people but the truth remains the same and is anchored on the Scriptures. There are church-wide events that cater to both emotions and intellect, I think that in itself is the power and wisdom the Holy Spirit that is manifested through the leaders of the church. They understand that there are different types of people that come in to the church, but more importantly, these truths are really meant to be addressed anyway. 7. What’s one of the biggest challenges you face as a Christian? Besides doing the spiritual disciplines consistently (Bible reading, devotion, meeting in small groups/fellowship, fasting etc. ), it’s really just practicing what I believe in. It takes more faith to believe that we’re results of spontaneity, an accident if you will, than to believe that there is a designer, a God who created the universe. I am a Christian because I believe in Jesus, the reality of my brokenness, and that he reached out to me even when I wasn’t looking for him, i believe because of what God has done not only in my life, but in the lives of my family members, my friends, and many other people who have given their testimonies. Jesus did not come to make bad people good anyway, He came to make dead people live. I’ve seen impossibles become possible because of him, He alone’s able to transform lives. Thank you so much for sharing your perspective, Julia 🙂 It’s so cool that you’re part of a cell group where most of the girls know their MBTI types!